Before you can walk the walk, you have to learn to talk the talk. That’s why every TGA class includes lessons on how to speak like a pro. Our coaches cover everything from the parts of the club and course to the lingo of the game. Learning new vocabulary words, like the ones listed on the right, is part of the many academic portions of the TGA program. Student handbooks, along with our coaches’ teaching aids, give participants an opportunity to learn useful terms that can help them become better players in class as well as work on their communication skills. Being able to talk the talk applies to many situations in life, one being when our students eventually get out on the golf course. After all, there are plenty of golf terms that may have a different meaning in other situations. For example, if someone on the golf course says a hole doglegs to the left without the prior knowledge to know that means the hole makes a significant turn to the left before reaching the green, that term could cause a lot of confusion. Another example is the term relief. On the golf course, that means you area allowed to move your ball away from an immovable object. We certainly wouldn’t want someone taking relief in the other context out on the golf course, without use of the proper facilities. If you want to cover golf vocabulary at home, a fun way to learn about new terms is by watching a golf tournament. 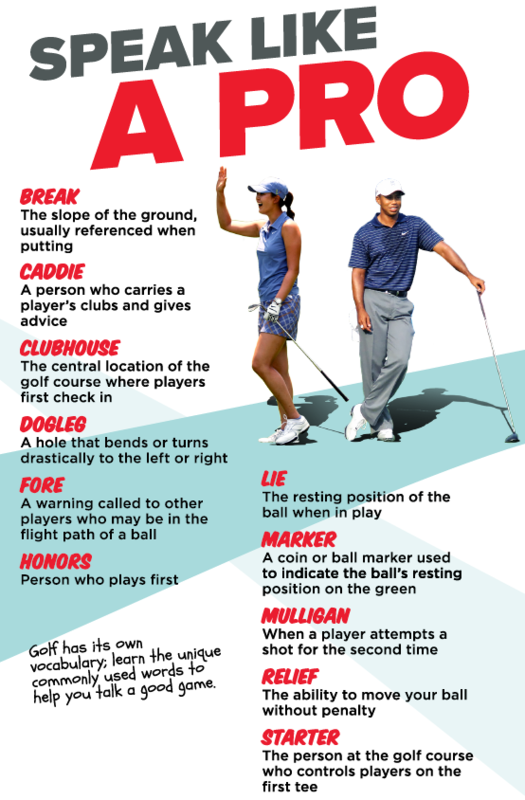 The broadcasters use a lot of golf lingo that can help a student understand when and why a term is used. Some golfers and caddies will have microphones on them as well, which provide great insight into conversations the pros have on the course. If your child wants to put his or her golf lingo to the test, one of our upcoming programs is the perfect place to speak like a pro.